This year, we're adding incentives for team members and donors. All team members who sign up will receive a $5 donation. 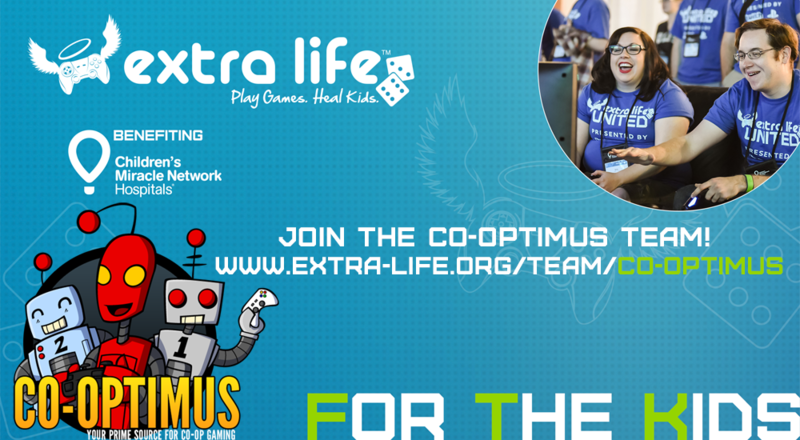 In addition, we will be giving away game codes for all team members AND all donors! It's easy to sign up. Just head over to our team page and click "JOIN OUR TEAM" near the top of the page. They'll ask you if you want to be a Classic or Platinum participant. If you choose Platinum, you'll donate $15 to be eligible for cool prizes, like T-shirts and medals depending on how well you do with your fundraising. Classic membership is free, but doesn't offer as many incentives. Both memberships include a warm fuzzy feeling knowing that you've helped the kids and families who visit the hospital you choose during registration. That's right, you actually get to choose which hospital your fundraising will benefit. All the donations made on your page will go straight to that hospital, and they choose how the funds are spent. It could be spent on critical hospital equipment, or it could assist a family who can't afford to pay for their child's treatments. Game Day is on November 5th, so let's get those donations rolling in. Are you busy on November 5th? No problem! There's no obligation to participate in Game Day activities, the important part is raising donations. That said, if you are available on November 5th, we invite you to play some games with us, watch us and chat with us on our Twitch channel, and enjoy your game-filled day.